Online slot developer Microgaming is getting used to having to prepare itself for a flurry of excitement and hysteria ahead of a sequel slot release. It was only in 2013 that fans of outstanding The Dark Knight slot were being teased with the release of its sequel slot The Dark Knight Rises. Fast forward a year and 2014 has got Microgaming slots fans all in a hot fluster once again with the release of this sequel slot to the rather underrated Avalon slot. However, Microgaming has really stepped up its game for this second outing of the popular mythical-themed slot. 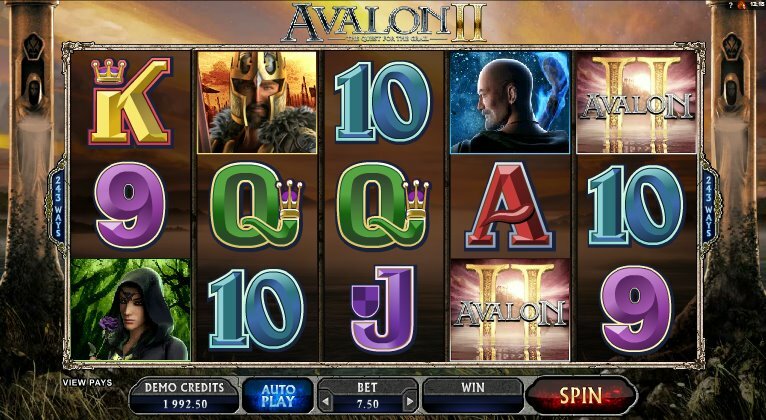 Avalon II is a 5 reel, 243 ways to win slot that is based on the magical legend of King Arthur and his knights of the round table. The slot has the tag-line “The Quest for the Holy Grail” and that is the story of this slot. Find the grail and win big prizes. Monty Python addicts can settle down for one second because this is slightly more serious than their comical take on the King Arthur tale. There is a Black Knight on this slot but he certainly won’t be hopping around on his torso with no arms or legs telling you “tis but a scratch!”. Other symbols included on the reels are Merlin, King Arthur, Guinevere, Morgan and the regular 9 through to Ace icons. These symbols offer dynamic animations whenever you hit a winning combination involving them. The stand out one for me was King Arthur slashing away with his sword. The Lady in the Lake acts as the Expanding Wild. She will expand across the entire reel when she appears on the central reel and will substitute for other symbols, except for the Holy Grail Bonus symbol to complete winning combinations. The Avalon II Logo also acts as a Wild on this slot. This slot has an interesting format of being split up into seven different bonus features. Every time you trigger the bonus feature by hitting three or more Holy Grail Scatters across the reels you will be taken to the next stage of the bonus features that are presented on a map. The first bonus feature that is triggered is the Lake of Legend Bonus. This is a simple dice roll bonus feature where you win prizes if you hit the right numbers on the dice to reforge Excalibur. You will then be taken back to the base game once this bonus feature is complete. The second bonus feature triggered is the Misty Vale Bonus. On this bonus feature, you are given the chance to choose your Wild from one of the symbols on the reels giving you an opportunity to complete more winning combinations. You will be awarded with 15 free spins on this feature. When you trigger the bonus features for a third time you will be given the chance to choose between two bonus features to play. You can either opt for the Whispering Woods Pick ‘em Bonus or the Trailing Wild Forest Falls Bonus. It depends if you fancy winning instead prizes or want to play an Expanding Wilds-style game to win bigger prizes with more risk. You will be given 20 free spins if you select the Forest Falls Bonus. The fourth feature you will trigger is the Dusky Moors Bonus where you will be taken to a second screen where you must match different helmets hidden behind cards. The more helmets you match the more chance you have of winning bigger prizes. If you match two golden helmets then you could win at least 9,000 coins. The fifth feature triggered on this slot is the Morgan’s Keep Bonus. You will be awarded 20 free spins when you trigger this feature. This has a Rolling Reels feel to it where symbols disappear when they make up a winning combination and new symbols will fall down to replace the symbols that have vanished. The Hall of Shadows Bonus is the sixth feature on the map. On this feature, you must fight the Black Knight in a duel. If you strike the Black Knight you can win coins and the aim is to win the most coins by defeating the Black Knight in battle. 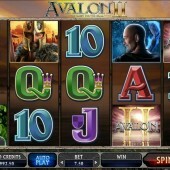 The final bonus feature on offer is the Isle of Avalon Bonus that comes in the form of a wheel of fortune. This wheel of fortune will spin to decide what prize and bonus multiplier you can earn. Avalon II attracted a lot of hype in the run up to its release and it is an epic slot in all manner of speaking. The music, the sound effects and the visual effects are all top quality and this is a slot that really does not disappoint. Microgaming might have lost The Lord of the Rings slot from its arsenal for the time being but the void left by that slot has been well and truly filled by this effort. Microgaming’s best slot so far? It is not far off! Play this slot. It is history in the making.